Gaming isn’t always about having the best graphics or storyline. Sometimes just having plain fun is enough. Square Heroes is an indie game very fitting to that description. While having minimalistic graphics and no real storyline to speak of, it is easy to pick up, but hard to master. And just plain, good and healthy fun. 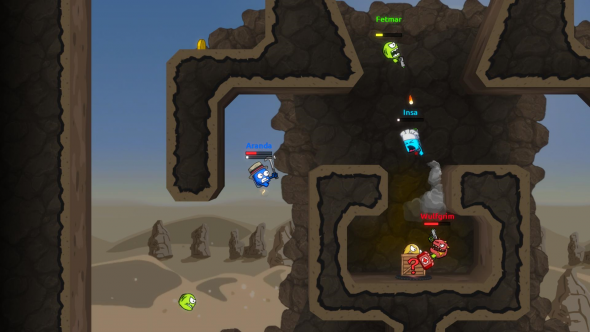 Square Heroes is the online multiplayer sequel to Square off, which was released on Xbox and mobile platforms in late 2009. The single player mode is pretty limited, and any gamer should be able to blast through it in an hour or two. In this extended tutorial, you are introduced to the game mechanics. The player is a square with a jetpack fighting other creatures, ranging from a robot to a bird. Although all bots have some ‘dialogue’ (they’re aliens, so they don’t really speak English) no real story is discernible. The one thing that ties these random matches together is that you are taking part in an intergalactic tournament, culminating in the final level where you can fight the alien lord. This one last level is very different from the previous ones, for starters the passive mobs are now the enemy, and your previous opponents are now on your side. After fighting endless waves of enemies, we get to meet the alien lord head on, concluding the singleplayer mode. The graphics are very minimalistic and cartoonish, which suits the not-so-serious mood of the game just perfectly. You get to customize your square with a color, unlockable melee weapons and hat of your choosing. NPC enemies have different models and it would be nice to have these available to the player as well. The arenas are equally sober, but have some different themes to them as well as layouts. The different weapons and hats are recognizable enough and are pleasantly diverse. The feature where you can change your characters facial expression is fun at times and really looks good in the cartoonish style, but not really used much. The background music is lighthearted and uplifting, as are the sound effects. But let’s be honest, you probably won’t hear much of it over the cries of anger from your friends. What does pop out whoever, are the announcements like the classic ‘MULTIKILL’. One thing that does get a bit annoying are the blips when you pick up coins. Especially when you are slaying your opponents mercilessly it gets a bit much. As this game is a MOBA, each game you play you will start out with only your basic weapon. In this case, a melee weapon ranging from a chicken to a full blown battleaxe. By slaying passive creatures you earn coins which unlock the next item in your arsenal. This means everyone can just pick up a controller and join in on the fun without having a noticeable disadvantage. Most of these passive NPCs are harmless, but some explode and different types drop different amounts of coins. In total your square has three bars, one for health, one for ammo, and the progress bar for your next unlockable weapon. Health and ammo can be refilled by shooting the right box and picking up the refill. By leveling your character you get access to a bunch of different weapons to customize your loadout like the flamethrower, speargun, sticky grenade launcher and many more. Not only can you unlock functional weapons, there’s also hats to unlock! From baseball cap to a gentleman’s fedora, or just a traffic cone, many options are available. The controls, basic as they are, are very functional, and feel very natural. One annoying omission from the controller mode is the crosshair, which makes aiming with mouse and keyboard just a bit more easy. Although still doable with just the analogue sticks, a crosshair would make for just that last bit of precision. Then there’s the different game modes. While deathmatch and team deathmatch revolve around who can get the most kills, there is also gnome hunt. In this particular gamemode, players and bots battle to capture the most golden gnomes. The last game mode available is survival. This one is very different from the other ones, in this game mode players (and/or bots) work together to fight the not-so passive anymore NPCs for a set amount of time with the only objective being survival. Square heroes plays best with controller, that way four different people can play on the same machine. It is even possible to play online and local multiplayer at the same time (couch vs couch), source of endless fun. The fast-paced action is sure to stay interesting for a while! Although the mechanics might look simple, they make for endless possible scenarios. Some more variation in the gamemodes like capture the flag for instance wouldn’t hurt though. Furthermore the game keeps track of your current stats like total wins and K/D ratio, as well as achievements and unlocked weapons. 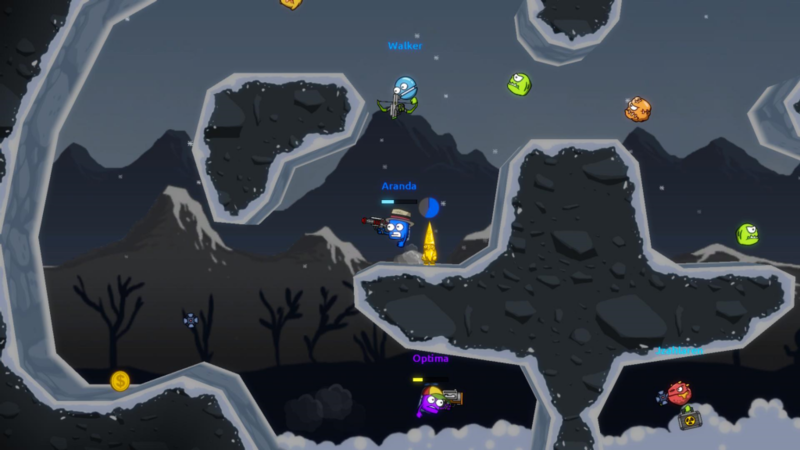 While great fun to play, Square heroes is still a young indie game. This translates to limited content and playerbase, which might change if it is greenlit on steam. Although the singleplayer is very limited, Square Heroes really shines in multiplayer. While not offering much for the lone gamer, it might just be the perfect pick-up-and-play game for when you are hanging out with friends.